Why Warriors Lie down and die is essential reading for anyone interested in indigenous peoples. It provides hope and new direction for those searching for the answers as to why "the problems" seems to persist in Aboriginal communities. It also offers insights for those who want a greater understanding of the issues involved in achieving true reconciliation. In Arnhem Land, as in Indigenous communities across Australia, the situation is dire; health is poor, unemployment is rife and life is short. Why Warriors lie down provides a fresh analysis of this crisis and offers examples of how the people can once again take control of their own lives. Finding the real cause of this crisis requires the reader to look at it from the other side of the cultural / language divide - the side where the Yolngu people live. The Book Why Warriors Lie Down and Die takes us to that side. A detailed account of life in Arnhem Land before & after European invasion with analysis of the continuing gap between indigenous & non-indigenous life events & with some hope that we (the white dominant culture) might aim to correct the outcome of past activities. I learned a great deal about the rich and resilient culture and practice of Australian natives and how well meaning government programs have worked to undermine them. Useful implications for knowledge management and for cultural and relational interactions in any realm from personal to organizational. 5.0 out of 5 starsJust Awesome! A Must Read! This is now my favorite ethnography! Well written! Great book! An outstanding piece of work that describes in detail the clash, misunderstandings and overwhelming sadness when sophisticated stone age culture meets the culture of the post industrial age. 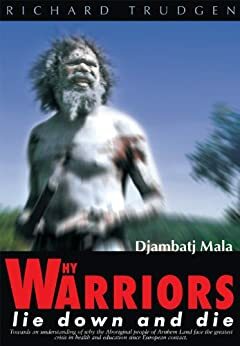 Written in a narrative style that is clearly sensitive to being more respectful and unpatronising than earlier works on and about Australian Aboriginal society. A book that should be compulsory reading for all Australians. This book has hit me hard! I work with children who have seen and/or gone through what is outlined in this book, and I am getting a better understanding of where they are coming from.